Oreo Popcorn needs only 3 ingredients and just a few minutes to make. It’s guaranteed to make movie night a hit! 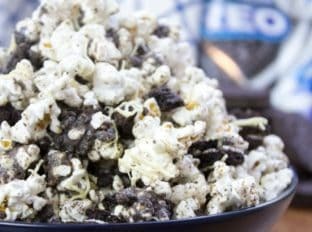 Oreo Popcorn combines two of my favorite snacks in just a few minutes and doesn’t cost you a fortune like other fancier popcorn places would charge! Have you seen the prices on premium popcorns? When I was at the Fancy Food Show in San Fransisco I would venture to say about 5% of all the vendor booths were selling popcorn. 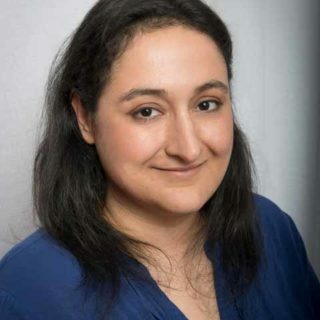 When I did a bit of research about their products I was floored! Most of the coated popcorns are incredibly expensive. So in comes the idea to make it at home. 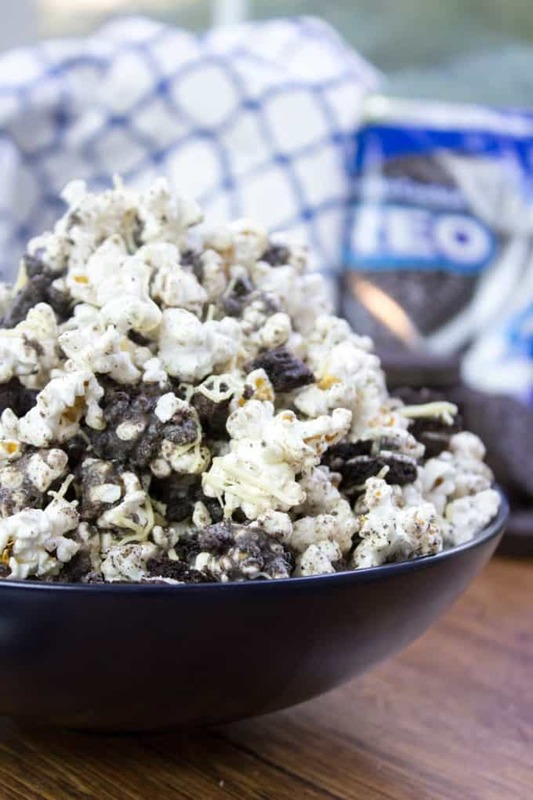 You may have already seen a couple of other popcorn recipes on the site but here are some alternate ideas to Oreo Popcorn if that isn’t the flavor you’re looking for (but just between us… it totally should be, this popcorn is AMAZING). Caramel Popcorn – Also on the blog, and mixed with the cheddar popcorn for an awesome Chicago Popcorn mix. Peanuts – Add peanuts to the caramel corn idea for a Cracker Jack popcorn copycat. Smore’s – Add crushed graham crackers, marshmallows and chocolate chips to the popcorn and toss with white chocolate. Peanut Butter – Add in powdered peanut butter to your melted white chocolate and toss. Strawberry Creme – Add freeze dried strawberries and melted white chocolate for an awesome sweet and tart combination! Candy Mix Ins – Add in your favorite candy whole or chopped up! The actual recipe and method for this popcorn really couldn’t be any easier to make. I do suggest eating it fairly quickly as popcorn tends to get stale in no time at all. 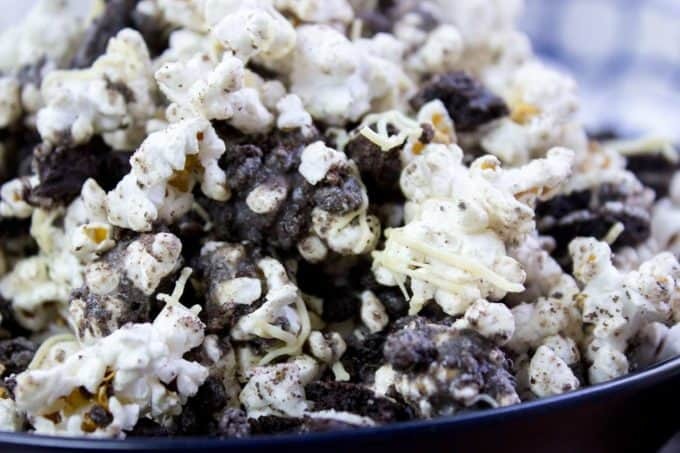 Oreo Popcorn needs only 3 ingredients and just a few minutes to make. It's guaranteed to make movie night a hit! Melt white chocolate in a microwave safe bowl in 30 second increments until fully melted. Drizzle most of the white chocolate over popped popcorn in a large bowl. 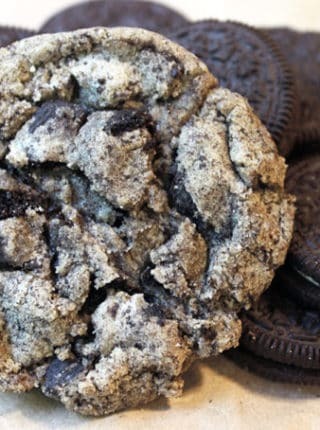 Add in the oreo crumbs and toss together. Drizzle the remaining white chocolate on top of the popcorn. Let set then break apart gently. Would these be good to make, bag and ship to a college student? I hesitate to say yes as popcorn tends to get stale in no time at all but you could try sealing it quickly in packaging right after making it and giving it a try. Though I’m sure it will be appreciated no matter what. I don’t remember ever receiving a package as a college student that I didn’t gobble up immediately…or it was devoured by roommates, haha! Looks like such an easy and fun snack! It combines the best of both snacking worlds in one bowl. Thanks, that’s what I was going for! Oh my gosh this looks dangerous!! I love Oreos and to pair them with popcorn makes for an amazing movie night treat! I wish i could try this popcorn right now. It looks so delicious. My kids are going to love it. Thanks Lisa! You’ll love it! Who couldn’t love oreos, white chocolate and popcorn! haha. We love to snack on popcorn. This recipe looks so delicious. I am excited to make some for movie night. 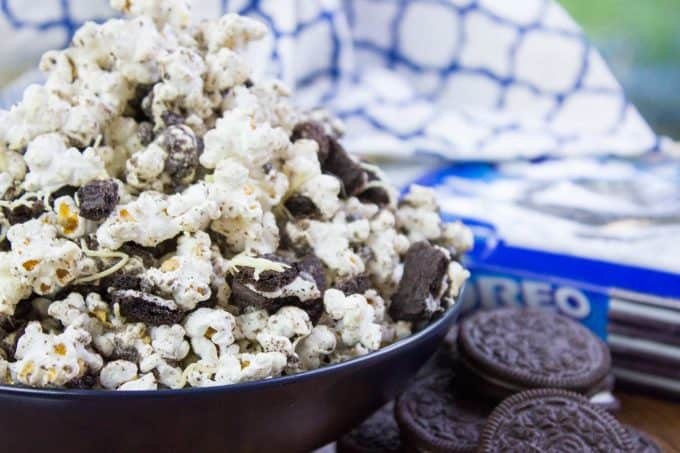 Oreo popcorn looks so delicious and easy to make. I will have to try making some this weekend. Okay i don’t care for ‘boring’ popcorn, but this sounds absolutely genius! 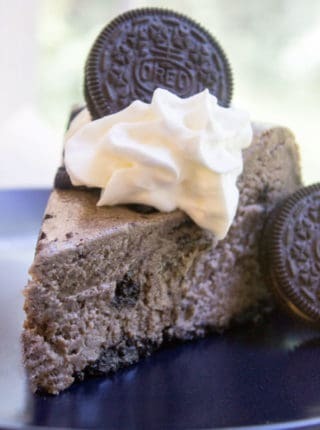 I just might even make this for a party! That may be the best things I have seen all day! I am trying this as soon as I can! I love this combo of flavors and textures ! Wish i had some oreos in the pantry. I’d be munching all night nom -nom ! This looks really good! I’m sure my youngest would love this. She loves Oreos a lot. I’ll have to make this with my daughters sometime soon. 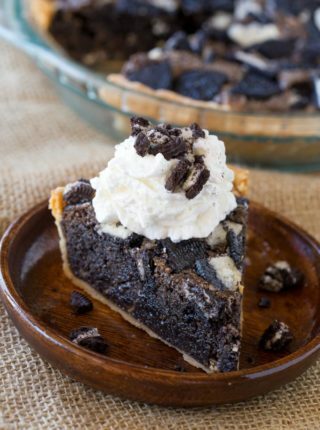 This is a perfect snack for us Oreo-lovers! Oreo popcorn sounds like an interesting twist for sure to our regular popcorn snacks. I will have to try this! Ahhhh! I have to try this! I’ve been thinking on and off all day about popcorn and never made any. But now I have something new to try and will be making it tomorrow (it’s bedtime now, haha). I can’t wait. Holy cow! That looks amazing. 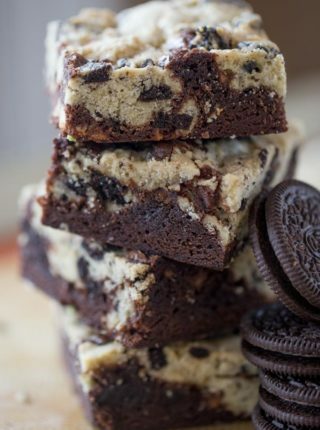 I love popcorn and Oreos so this would totally be my go to snack! My kids and husband really devoured the batch I made! Make a lot because it goes quick! My kids are huge fans of popcorn and Oreos. I bet they would just gobble this up! I bet they would too, I know mine did! This looks like the perfect blend of salty and sweet. My girls would devour it – the hubby too! Same thing happened in our house – my husband and kids devoured the batch I made! Thanks! Oreos on everything is a great idea as far as I’m concerned! Oh my gosh! That looks awesome!! I have never thought about doing something like this I KNOW we would love it! Thanks! It’s hard not to love Oreos! Super yummy snack idea. My kids would love this. MMMMM i can’t wait to make this. I have Thin Mints too so I may need to make a batch with those! Thanks, Abby! Let me know how they turn out!